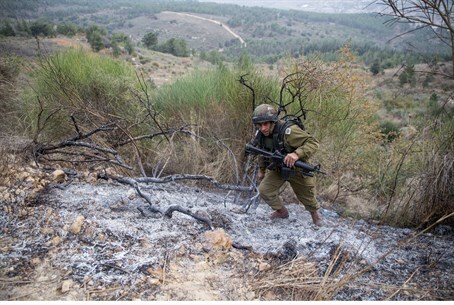 Authorities in Lebanon arrest two suspects in the Katyusha rocket attack on the Upper Galilee. Authorities in Lebanon arrested on Friday two suspects in the early morning rocket attack on Israel, The Daily Star reported. The Internal Security Forces detained a suspect allegedly behind the rocket fire into Israel, security sources told the newspaper. Hussein Izzat Atwe from the Hasbaya village of Hebbarieh was arrested in Al-Bire Hospital in the Bekaa Valley, where he was receiving treatment for severe burns. The National News Agency reported that Atwe confessed to belonging to extremist groups and also said that two Palestinian Arab men were with him when he launched the rockets. Authorities are searching for the two suspects, according to The Daily Star. The Katyusha rocket was fired towards the Upper Galilee, and exploded in an open region, causing no physical injuries or damages. Residents of the region reported that that they heard explosions. Lebanese sources told The Daily Star that Lebanese Army Intelligence had found traces of six rockets in the Mari area in the Hasbaya region, some two kilometers from the Blue Line, the de facto border between the two states. They said the Army defused two 107mm Grad rockets that were prepared to be fired toward Israel following a search for launch pads. The IDF had returned artillery fire following the rocket attack, targeting locations in Lebanon suspected of being the source of the rocket fire.